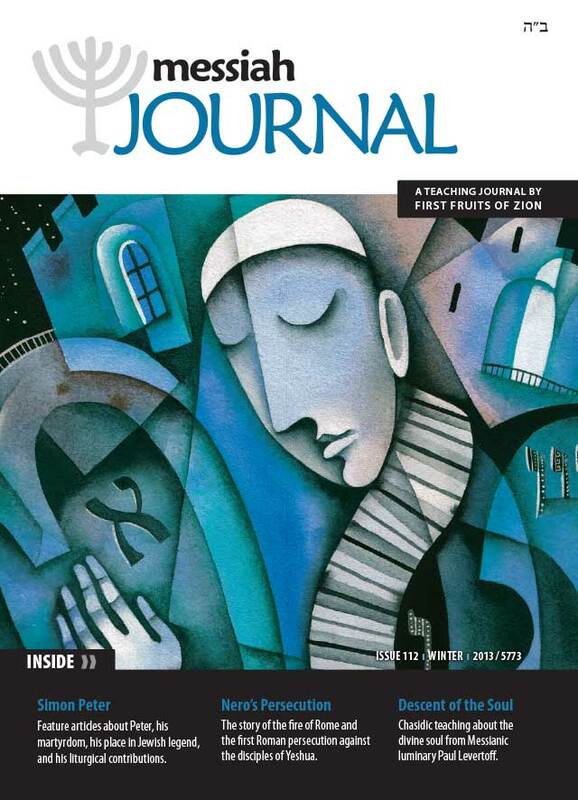 Feature articles about Peter, his martyrdom, his place in Jewish legend, and his liturgical contributions. The story of the fire of Rome and the first Roman persecution against the disciples of Yeshua. Chasidic teaching about the divine soul from Messianic luminary Paul Levertoff. Director’s Letter: What Can One Person Do? Boaz reflects on his recent visit to South Africa and talks about his interesting enounters with the people who share in the vision, and discovering more about the country's history, and shares some of the personal lessons learned. Some very positive feedback from many readers across the globe. A Messianic Jewish perspective on the eschatological calling that God has placed upon the Gentile disciples of Yeshua. D. Thomas Lancaster retells the story of Peter's death from historical, traditional, apochryphal and liturgical documents, and elaborates on the historical events in Rome during the time of Peter, including the persecution under Nero. Peter is a source of inspiration and even veneration—and not just for believers. Surprisingly, Peter actually appears a few times in rabbinic literature in a positive light. Toby Janicki brings out some interesting faith-nuggets of in this very informative article. The book of Zechariah mentions a fast that takes place in the tenth month. Traditionally, this is seen as a commemoration of the destruction of Jerusalem which began in the year 588 BCE. Etten Tehillah is a stirring and masterful poem recited at the climax of the Yom Kippur service. Could it have been written by one of Yeshua’s chief disciples? Does the style or structure of Etten Tehillah give us any clues about its authorship? Included in this issue is the full text of the poem in parallel Hebrew and English with numerous footnotes to each verse. Simeon of Jerusalem, son of Clopas, in Jewish and Christian Tradition—a Jewish leader and according to early Christian tradition, the successor of James. Learn more about the hand that early Jewish believers had in the formation of traditional liturgy. The story of a meeting between two persons at a bus station in Israel. Two persons, two religions, two peoples—different worlds. Learn something about aspects of life in Israel. Tsvi Sadan takes a quick look at the passage in Mark 7 that is often referred to when teaching or implying that Jesus aborogated the biblical command about clean and unclean food. James Pyles concludes this comprehensive series on supersessionism and replacement theology in the church. Jacob Fronczak’s thought-provoking article on Sola Scriptura, the second installment in a new series on Protestantism, asks serious questions about trying to interpret the Bible outside of a traditional, Jewish matrix. In Part 4 in the series on the Shema, Russ Resnik focusses on "Loe Your Neighbor as Yourself." Vine of David presents the sixth installment in a series of articles translated to English, for the first time ever, Paul Philip Levertoff’s classic study, Die religiöse Denkweise der Chassidim (Leipzig: J. C. Hinrichs, 1918). Another book review: The Synoptic Gospels Set Free: Preaching without Anti-Judaism, by Daniel J. Harrington. Review by Jacob Fronczak.